Time spent in and around pools, lakes, and beaches can be a fun experience. Yet, serious swimming-related injuries can occur in water. In fact, drowning is one of the leading causes of injury and death among children aged 1 to 4 years old in Virginia. Sadly, during this week last year (May 27 – June 5 2016) there were five accidental drownings in Virginia. Several factors put young children at high risk for drowning. Young children are physically top-heavy, active, curious, and impulsive. Young children often do not understand the dangers of pools and standing water. Children do not struggle in water and often drown without making a sound. Most drownings involving young children occur in residential settings while under the supervision of an adult. Non swimming-related drownings often occur in children under the age of one in bathtubs, buckets, or toilets. Adolescents are also at risk of drowning in natural bodies of water during sports and recreational activities. Long-term effects of drowning-related injuries may include brain damage that can lead to memory problems and permanent loss of basic functioning. Despite these consequences, drowning and swimming-related injuries are often preventable. Barriers such as pool fencing have been shown to prevent drowning and swimming related injuries. Learn to swim. Learn life-saving skills, including swimming basics and cardiopulmonary resuscitation (CPR). Be prepared. Have rescue equipment by the pool, post 9-1-1 emergency information, and think through an emergency action plan. Supervise when in or near the water. 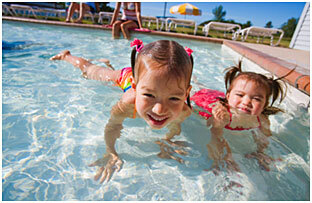 Never leave a child unsupervised near a pool/spa, standing body of water, pond, bathtub, toilet, or water-filled bucket. Look in pools first if a child is missing. Clear the pool and deck of toys. Remove toys from the pool and surrounding area immediately after use so children aren’t tempted to enter the pool area unsupervised. Use the buddy system when swimming or boating. Communicate pool safety tips with the babysitter and ensure they are trained in CPR. Use Coast Guard approved life jackets. Never rely only on flotation devices (water wings, noodles) or swimming lessons to protect a child. Install four-sided fencing. An unclimbable, five foot fence should separate the pool/spa from residences. Fence openings should be no more than four inches wide so children cannot squeeze through spaces. Fence gates should be self closing and self latching. Areas beside the outside of the fence should be free of objects that can help children climb the fence, such as tables, chairs, or tree branches. Don’t swim in the dark. Avoid alcohol before and during swimming. Consumer Product Safety Commission. Virginia Graeme Baker Pool and Spa Safety Act; Water Watchers.